Committed to your low-carb diet, but missing lasagna like crazy? Never fear! This hearty recipe for Zucchini Lasagna, a selection from THE EVERYTHING LOW-CARB MEAL PREP COOKBOOK by Lindsay Boyers, is here to save the day! Cottage cheese is available in large curd, medium curd, and small curd. In layman’s terms, the curd refers to the size of the chunks that are in the cheese. When using cottage cheese in lasagna, it’s best to go with small curd, as it will mix the best with the ricotta, and you won’t even know it’s there when eating the finished product. Heat olive oil in a medium saucepan over medium heat. Add garlic and cook until fragrant, about 2 minutes. Add onion and cook until softened, about 4 minutes. Add beef and cook until no longer pink, about 7 minutes. Add tomato sauce, tomato paste, Italian seasoning, oregano, parsley, 1 teaspoon salt, and pepper to the cooked meat and stir to combine. Reduce heat to low and allow to simmer 1 hour. While sauce is simmering, sprinkle 1 teaspoon salt over zucchini slices and let sit 10 minutes. Combine ricotta cheese, cottage cheese, Parmesan cheese, parsley, and eggs in a medium bowl and stir to mix well. Layer 1/3 of the zucchini slices in the bottom of a 9″ x 13″ pan. Spread 1/2 the ricotta mixture over zucchini and then spread 1/3 of the sauce on top of that. Put down another layer of zucchini, using 1/2 of what’s left. Top zucchini with the rest of the ricotta mixture, sprinkle 1 cup mozzarella cheese on top of that, and top with half the remaining sauce. Assemble one more layer using the rest of the zucchini slices topped with the rest of the sauce and sprinkled with the remaining mozzarella cheese. Bake in oven 1 hour or until hot and bubbly with cheese slightly browned. Allow to cool. Cut into six equal portions and transfer each portion to an airtight container. Store in the refrigerator until ready to eat. 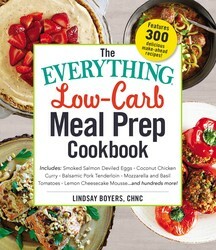 For 299 more recipes for healthy, low-carb meals, pick up a copy of THE EVERYTHING LOW-CARB MEAL PREP COOKBOOK. And get your FREE low-carb summer menu here! We’ve got breakfast handled for you too with this recipe for Cinnamon Swirl Muffins that’ll brighten your mornings. Excerpted from The Everything Low-Carb Meal Prep Cookbook by Lindsay Boyers, CHNC. Copyright © 2018 by Simon & Schuster. Used by permission of the publisher. All rights reserved. 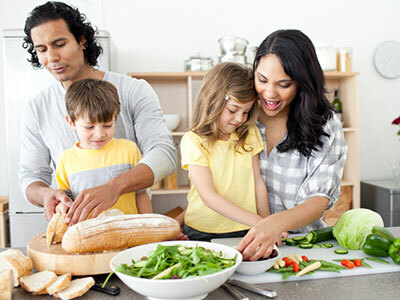 300 fresh, simple, and easy recipes that combine the benefits of the popular meal-prep trend with the long-standing success of the low-carb diet—as well as a two-week meal plan and shopping guide to make cooking a snap!